We hope you have had a fun, safe, and relaxing summer! 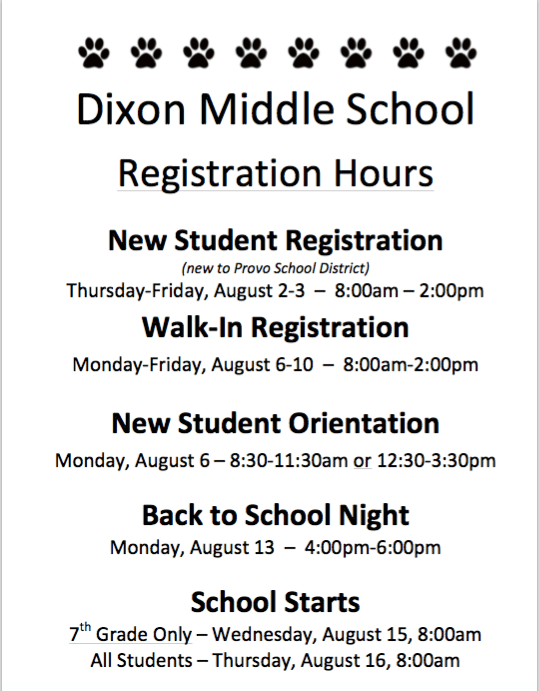 We are excited to open Dixon’s doors and start another wonderful school year. Here’s some information you may be wondering about before that time comes. See you soon! Student Packets: (including: Schedule, Fee Sheet, Calendar, and info) have been mailed and should be received by Friday, August 3rd. Registration: All parents/guardians must update/verify students’ information online at PowerSchool as soon as possible to insure Dixon has correct demographic and emergency contact information. If you need to set up a parent account, choose the New Student Registration tab. New Student Enrollment: Students who have moved into the Dixon boundaries or have been accepted on school choice, and have not had an opportunity to request their classes, may do so on August 2-3 from 8 a.m. until 2 p.m. The following documents are required for new student enrollment: Birth Certificate, immunization records, and proof of residency (mortgage or rental agreement, or current utility bill). Immunizations: Incoming 7th grade students are required to have the following immunizations:Meningitis, Tdap booster, and two Varicella shots or previous history of chicken pox. Returning Students: Students who receive incomplete schedules in the August mailing, or those requesting schedule changes should visit Dixon’s Counselors August 6-9 (8 a.m.-2 p.m.) to complete their schedule. 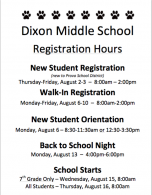 School Fees – FREE Dixon t-shirt: Fee payment information is delivered by mail the first week of August. Fees should be paid or waived (see Fee Waiver info in Dixon’s mailing) by Tuesday, August 14th . Those meeting this deadline will receive a FREE Dixon t-shirt. New Student Orientation: All students new to Dixon may attend Orientation on August 6th to make new friends and learn more about Dixon. Students can choose to attend a morning session from 8:30 a.m. – 11:30 a.m. or an afternoon session from 12:30 p.m. – 3:30 p.m.
Back to School Open House: August 13th from 4:00 p.m. to 6:00 p.m.
First Day of School: Only 7th grade students will report to Dixon on Wednesday, August 15th at 8 a.m. for a full day of school. All students will report for classes on Thursday, August 16th at 8 a.m.